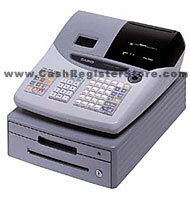 Casio CE-T100 Electronic Cash Registers at Cash Register Store. The Casio CE-T100 is a full featured, stylish, lightweight cash register. The printer is thermal with alpha numeric characters. An electronic journal is kept that can be printed at the end of the day. The cash drawer is a standard 4 bill, 5 coin with removable cash till. The drawer has a media slot for sliding checks under the cash till. A multi-purpose cash tray is located above the cash till for storage of other items. These cash registers come standard with a pop up rotary customer display. Buying these cash registers from Cash Register Store entitles you to FREE tech support. This is a service you will not find with large chain retailers. Other excelling features on the Casio CE-T100 include the high amount of departments (24, w/ shift 96), PLU's (1000), and sign on clerks (25). Instructions for programming in Spanish are included with the English manual. (W) 14 ½"x (D) 18 ½"x (H) 11"